Eastern junior Mason Dishong (24) goes in for a contested shot attempt over River Valley defender Chase Caldwell (14) during the first half of Friday night’s season opening boys basketball contest the Eagle’s Nest in Tuppers Plains, Ohio. TUPPERS PLAINS, Ohio — Wow. Only a palindrome could describe the back-and-forth nature of Friday night’s season-opening boys basketball contest at the Eagle’s Nest, as host Eastern made a small 7-4 run in overtime to claim a hard-fought 64-61 decision over River Valley in a non-conference matchup in Meigs County. Both teams battled through 12 ties and 23 lead changes over the course of 36 minutes, and each squad held leads of at least two points in each of the four quarters of regulation … as well as the additional four-minute overtime session. The Eagles (1-0) — making their debut under first-year head coach David Kight — were the only team to muster a lead greater than two possessions, which included a nine-point cushion just before halftime and a 10-point advantage 11 seconds into the third frame. Despite spending a grand total of 3:16 in a deficit greater than two possessions, the Raiders (0-1) countered with a 19-9 third quarter charge that led to a 41-39 edge headed into the finale. The Silver and Black built their biggest lead of the game at 56-51 with just 57 seconds left in regulation, but a quick 4-1 spurt allowed the hosts to pull back to within 57-55 with 20 seconds remaining. Following a River Valley turnover, Sharp Facemyer netted two free throws with 5.1 seconds showing — tying the game at 57. River Valley managed a 22-footer just before the buzzer sounded, but the attempt missed the mark as both teams headed into overtime. RVHS — making its debut under first-year head coach Brett Bostic — actually struck first in the extra frame as Jordan Lambert hit a short jumper a minute in for a 59-57 lead. Isaiah Fish countered with a jumper 16 seconds later to knot things back up at 59, then Sharp Facemyer again sank two charity tosses at the 1:27 mark to give the Green and Gold a permanent lead at 61-59. 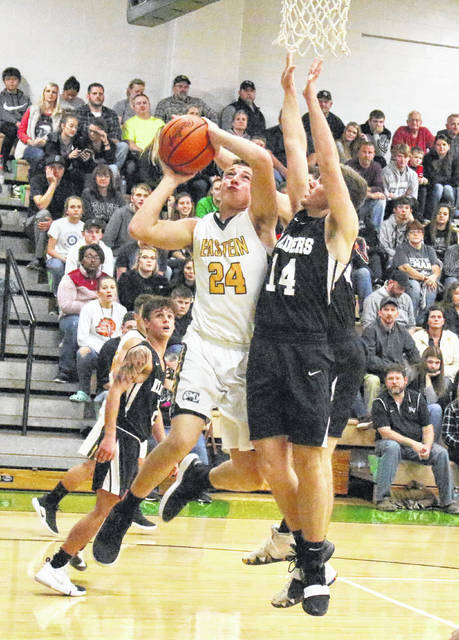 Eastern used free throws as part of a 3-2 spurt for a 64-61 edge with 18 seconds left, and Layne Fitch’s 25-foot desperation attempt bounced off the front iron as the horn sounded — giving the Eagles a three-point triumph. For a season opener, the game itself had more of a postseason feel to it — particularly from a fundamental standpoint. Both teams hauled in 32 rebounds apiece, with Eastern claiming an 8-4 edge on the offensive glass. 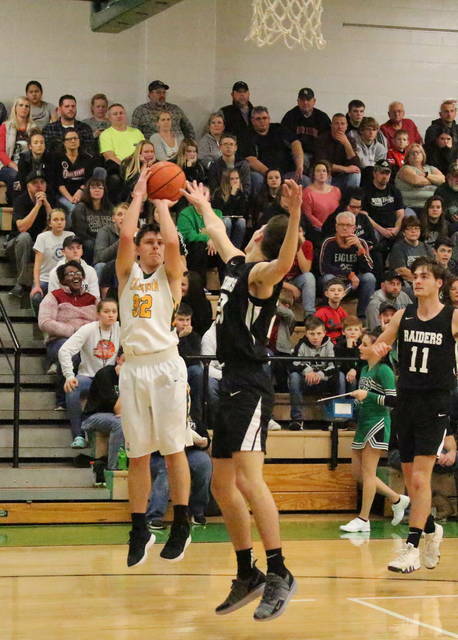 The hosts shot just 37 percent from the field, while the Raiders connected on 48 percent of their attempts. The real difference, however, came in the turnover department as River Valley had twice as many giveaways than the Eagles (20-10). The guests also committed five of the six total turnovers in the overtime session. Afterwards, Kight spoke about a whirlwind night of emotions that ended up resulting in his first victory with the Eagles. Conversely, it was a bittersweet start for Bostic as the RVHS mentor didn’t like the final outcome — but had little else to complain about following the game. There were nine lead changes and two ties in the opening frame alone, which led to a 14-13 Eastern advantage through eight minutes of play. Both teams were deadlocked at 19-all with three minutes left in the half, but the hosts answered with an 11-3 surge to take a 30-22 advantage into the break. 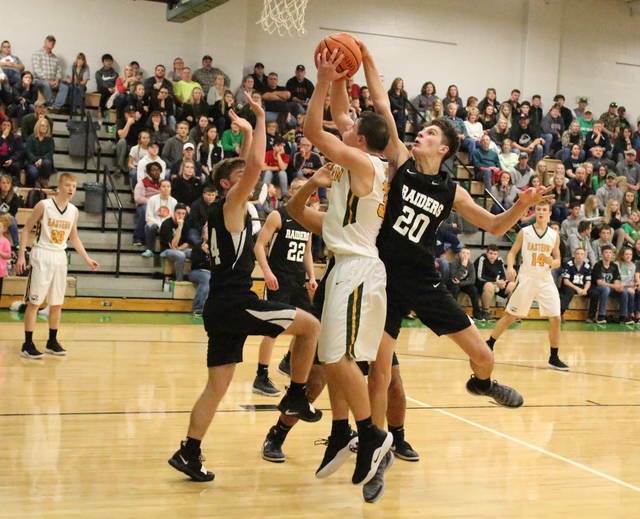 The Eagles never trailed in the third quarter, that is until Bradyn Eblin nailed a trifecta just before the buzzer — capping a 19-9 charge that resulted in a two-point cushion entering the fourth. Tied at 51-all with 3:39 remaining, the Raiders reeled off a 5-0 run over a 2:42 spell for a 56-51 lead. The Eagles ended up scoring 13 of the final 18 points in the contest. EHS connected on 23-of-62 field goal attempts for 37 percent, including a 2-of-15 effort from behind the arc for 13 percent. The hosts also netted 14-of-21 free throw attempts for 67 percent. Garrett Barringer paced Eastern with 20 points, followed by Isaiah Fish with a double-double effort of 17 points and 10 rebounds. Sharp Facemyer was next with 10 points and Ryan Dill chipped in seven points. Colton Reynolds and Mason Dishong were next with three points apiece, while Blaise Facemyer completed the winning tally with two markers. Barringer also hauled in six rebounds, with Dishong and Blaise Facemyer each grabbing five caroms. The Raiders made 24-of-50 shot attempts for 48 percent, including a 5-of-17 performance from three-point territory for 29 percent. The guests were 8-of-16 at the charity stripe for 50 percent. Lambert led RVHS with a game-high 24 points, followed by Fitch with 16 points and Brandon Call with 10 markers. Rory Twyman and Chase Caldwell were next with four points apiece, while Eblin completed the tally with three markers. Lambert led the guests with seven rebounds. Fitch and Call were right behind with six boards each.